The cascade of titles ending and beginning during Secret Wars is about to reach its height today. Not only is the event just two-thirds complete, but the All-New All-Different era starts with Invincible Iron Man before the old universe ends in the pages of the “Last Days” titles such as Ms. Marvel. Because the mystery of the new female Thor’s secret identity took precedence in the Thor title, it fell to Loki: Agent of Asgard to tell the “last” story of the Asgardians in Loki: Agent of Asgard Vol. 3: Last Days. Al Ewing and Lee Garbett complete Loki’s arc of redemption and truly move him/her into a new phase ... I’ll get back to that pronoun trouble shortly. It ends up being an ironic love, since King Loki’s existence poses a problem for Loki: in his future, life is perfect for the Asgardians, but in exchange, all of humanity must die. After my most recent re-read I was reminded of a similar situation in Transformers: More Than Meets the Eye when Rewind killed Megatron for the sake of the rest of the universe. Actually, Loki and Megatron have taken similar routes as of late, although Loki makes a far more credible hero. The climax of the first story in the trade is the culmination of the storytelling theme that has permeated the whole run of the book, with the God of Lies finally becoming the God of Stories in order to break out of his/her life cycle. Loki’s ability to change gender has been an inconsistent power: it was only recently used in comics starting in the Original Sin tie-ins, but it goes back to Norse myth, where he/she gave birth to Odin’s horse Sleipnir. Since the start of Agent of Asgard, Ewing has been insistent that Loki is gender-fluid, and while it’s taken literally in the comics, it’s a bold move to no longer align Loki to one gender. This was further explored in A-Force and will likely stay relevant in the context of the new Thor. It’s interesting to note King Loki’s negative reaction to this change in gender, which just makes these questions about identity and gender even more complicated. Much of the book is a Ragnarok storyline with Hela invading to support King Loki while the Asgardians fight back. It’s the type of story that has been done several times before, so at points it becomes almost an afterthought, but Ewing fills the story with numerous nods to Walter Simonson’s run. Once more, the Asgardians are shown using M-16s, while the final battle is overlaid with prosaic narration similar to the battle between Thor and the Midgard Serpent. The ultimate tribute is the origin of Verity Willis: as I had guessed, she’s the daughter of Roger Willis, the keeper of the Casket of Ancient Winters. Issue #15 spotlights her full story -- how she got her powers and how difficult her life has become thanks to them. Dan Jurgens’ Ragnarok gets referenced as well with the return of Those Who Sit Above In Shadow, the gods who outrank the Asgardians. They feed on the energy generated by Ragnarok cycles and have forced their hand to make it happen during Secret Wars. Loki teases the idea that they are the Beyonders seen in “Time Runs Out,” and while it’s never confirmed (at least not yet), I wouldn’t be surprised if this was true. Finally reconciling his/her selves -- Kid Loki of the past, God of Stories of the present, and King Loki of the future -- Loki ends his book by drawing an exit door out of oblivion to step out into an all-new and all-different universe with Verity at his side. It’s taken six years, three titles, two writers, several artists, and God knows how many crossovers, but the journey of Loki is finally complete. 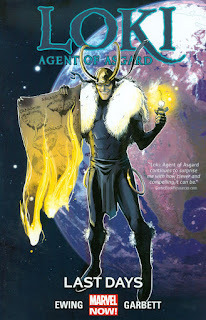 With Loki: Agent of Asgard Vol. 3: Last Days, a character once known as Marvel’s chief villain has become a legitimate hero ... or at the very least, he’s chaotic good. The creators have taken their own journeys: Lee Garbett has come into his own as a promising artist who will hopefully be a bigger name in the near future. Al Ewing has become one of the architects of All-New All-Different Marvel and the obvious successor for writing Thor once Jason Aaron is finished. Ewing might not be done with Loki yet, either: there are “secret members” on both his upcoming New Avengers and Ultimates titles, and Loki could be a match for either team. And at the rate Marvel has been making excellent announcements, I wouldn’t be surprised if Ewing and Garbett started up a new Loki title.